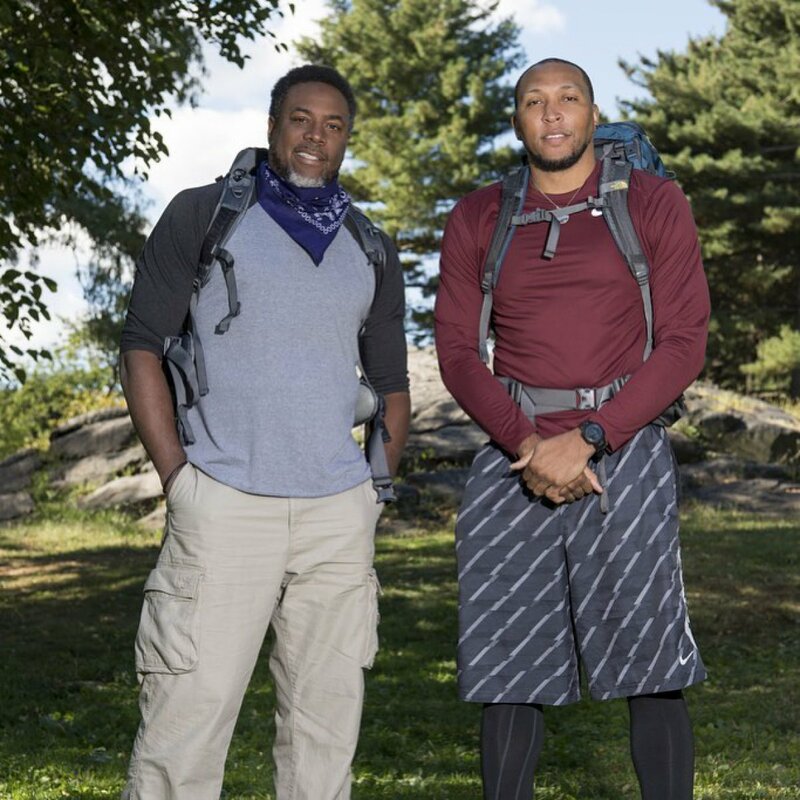 The Amazing Race team, Cedric Ceballos and Shawn Marion, survived a non-elimination leg during the third episode of the CBS reality competition's 30th season on Wednesday night. The Amazing Race host Phil Keoghan told the "Retired NBA Players" at the Pit Stop in Tangier, Morocco that -- despite finishing the third leg in last place -- they would continue racing for the $1 million grand prize since it's a non-elimination leg. However, the men will have to complete an additional Speed Bump task in the next leg before moving on. "I never really pushed myself like I pushed today, so it was a great test for me," Cedric said after learning the good news. "Let's go into OT right now. We're going into overtime -- we're still in the game. Speed Bump, we're waiting for you." The Amazing Race broadcast began with "Dating Couple and Former Big Brother Houseguests" Cody Nickson and Jessica Graf leaving the second Pit Stop in Antwerp, Belgium in first place at 6:51AM. Cedric and Shawn were on their heels at 6:58AM, followed by "Retired Professional Skiers and Friends" Kristi Leskinen and Jen Hudak at 7:03AM, "Dating Couple and Musicians" Trevor Wadleigh and Chris Marchant at 7:15AM, and "Friends and IndyCar Drivers" Alex Rossi and Conor Daly at 7:48AM. Behind Alex and Conor were Dating Couple and Lifeguards" Lucas Bocanegra and Brittany Austin at 7:55AM. The departure times were not shown for "Competitive Eaters and Friends" Joey Chestnut and Tim Janus, "Dating Couple and Yale Debating Teammates" Henry Zhang and Evan Lynyak, and "Twin Brothers and Firefighters" Eric Guiffreda and Daniel Guiffreda. The teams' first set of clues instructed them to fly to Tangier, Morocco, and upon landing, travel by taxi to a fish port and find one of three marked bins. The teams must then sort through a fisherman's daily catch and stack them all the same way into small crates. Once the fish were ready for the market, they teams would receive their next clue. When beginning the leg, Kristi and Jen acknowledged they are the only all-female team left this season and only three all-female teams have ever won the Race before. They wanted to make that four teams. And once Cody and Jessica hopped in their taxi in Morocco, Cody realized his driver didn't speak English, so he began speaking to him in Arabic -- much to Jessica's surprise. Cody explained that his strengths in the Race will all come from his military training having served in both the Air Force and the Marines. Cody had also been a member of a sniper team in Iraq. Evan also able to communicate to her taxi driver in the local language, having studied in Marrakesh in high school. Lucas and Brittany arrived at the fish bins in first place, while Kristi and Jen were struggled to communicate with their taxi driver. Once Kristi and Jen wasted enough time, they decided to run to the task on foot. Cody and Jessica completed the task quickly, however, their bin got rejected when they first asked to be judged because not all of the fish heads were facing the same way. But the team got it right on their second attempt. Cody and Jessica completed the fish task in first place, and they were then followed by Eric and Daniel, Trevor and Chris, Henry and Evan, Joey and Tim, Cedric and Shawn, Lucas and Brittany, Kristi and Jen, and finally Alex and Conor. The teams then learned they must make their way on foot to Kisariate Jbala Souk and greet the merchant with a traditional Arabic expression: "As-salam Alaykum," which means "peace be with you." Once there, teams had to grab a Travelocity gnome to run with for the rest of the leg. Henry and Evan managed to grab their gnome in first place, followed by Cody and Jessica, Trevor and Chris, Eric and Daniel, Kristi and Jen, Lucas and Brittany, Cedric and Shawn, Alex and Conor, and finally Joey and Tim. For the Roadblock, the participating Racers had to watch their gnomes zipline over the rooftops. The goal was to make their way through the busy maze-like streets and head up to different rooftops looking for the location where the gnomes had landed. Henry opted to take on the Roadblock task for his team as well as Jessica, Chris, Eric, Jen, Brittany, Cedric, Conor and Tim. Henry, Eric and Jessica then arrived at the first zipline location known as the Tangier American Legation Museum. They decided to work together, with Chris watching their teamwork from a distance. Cedric found his first gnome just as Brittany and Jen were beginning the Roadblock task. As everyone was looking for the gnome's first landing destination, everyone got pretty lost, including Conor -- who was working alone. Cedric, however, did quite well, and he released his second gnome down the zipline in first place. Though he tried to sneak off the rooftop without anyone noticing him, Cedric failed. Jessica and her group therefore headed to the Kasbah Museum, and at this point, Jen, Brittany and Conor had caught up to them. Cedric found this Roadblock to be one of "the most physically grueling challenges" ever, and he saw there being a disadvantage when it comes to his "old age." But Cedric managed to discover his second gnome in first place. The other teams soon spotted Cedric and ran to the same retrieval spot. Jen and Chris found the location next. The next clue sent the Racers to the Tele Boutique, where they must receive a secret message -- "Sabah Alkhyr," which means "good morning" in Arabic -- on an old phone. The Racers then had to run back to their teammates at the start of the task before reading their next set of clues together. Although Cedric finished the ziplining portion of the task first, he couldn't find the phone boutique. This mistake allowed Jen, Chris and Conor to pass him. Once Cedric got to the phone booth, it took him a few moments to realize coins for the phone had been placed in a little pouch the gnome was holding. At this point, Henry and Eric arrived at the phone, and on their heels were Jessica, Brittany and Tim, who eventually made their phone calls. As Brittany attempted to dial, Jessica suggested she'd hold her gnome for her. Jessica set it down on the floor, and then after Brittany received her message, she took off and forgot the gnome in the booth. Jessica wasn't going to say anything since they were in last place, and she hoped it would take Brittany a while to figure out her error. But Brittany noticed she was missing her gnome in no time, and she wondered whether the incident had been deliberate on Jessica's part. Henry and Evan completed the Roadblock task in first place. They were then followed by Kristi and Jen, Alex and Conor, Eric and Daniel, Trevor and Chris, Cody and Jessica in sixth, Lucas and Brittany, Joey and Tim, and finally Cedric and Shawn in ninth place. It then became time for the teams to complete one of two possible Detour tasks: "Drop It Off" or "Shake It Off." "Drop It Off" required the teams to pick up a long list of food items and deliver them in exchange for receipts. "Shake It Off" required the teams to belly-dance around tables of people while looking for three words that would reveal the name of the Pit Stop. Henry and Evan decided to dance, as did Alex and Conor, Trevor and Chris, Kristi and Jen, and Tim and Joey. On the other hand, the teams who decided to deliver food items were Eric and Daniel, Cedric and Shawn, Jessica and Cody, and Lucas and Brittany. However, once Cody and Jessica read the instructions for the food task, they immediately decided to switch and try dancing instead. Jessica and Cody were concerned the "Drop It Off" task as going to be too time consuming and exhausting in the heat and busy streets. While dancing, Alex joked that his moves were "pretty exceptional," but Conor disagreed, saying they were "actually the worst things I've ever seen." Tim and Joey struggled to find the three words as teams kept finishing the Detour before them. Before long, the guys noticed one of the words was actually written on a fellow dancer's stomach. Henry and Evan completed the Detour task in first place. They were then followed by Alex and Conor, Kristi and Jen, Trevor and Chris, Jessica and Cody, Joey and Tim, Eric and Daniel, Lucas and Brittany, and finally Cedric and Shawn. All the teams were then headed to the Pit Stop at "Moulay Hafid Palace," a peaceful courtyard built in the middle of the bustling city. Henry and Evan were the first team to step on the Pit Stop mat and meet Phil. For winning the leg, the pair received a trip for two to Switzerland. Alex and Conor arrived at the Pit Stop in second place, and then Kristi and Jen claimed third place, followed by Trevor and Chris in fourth place. Jessica and Cody then arrived and finished in fifth place, followed by Joey and Tim in sixth place. Eric and Daniel then stepped on the mat in seventh place, and right on their heels were Lucas and Brittany in eighth place. Finally, Cedric and Shawn eventually arrived at the Moulay Hafid Palace, landing in ninth -- and last -- place.